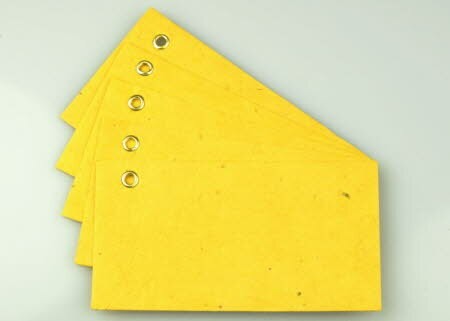 Yellow handmade lokta paper gift tags to match our Yellow paper, from the Vibrant A4 Computer Paper range, and our Yellow envelopes and Yellow lokta string. These handmade gift tags are 9 cm x 5 cm (approximately 3 1/2 x 2 inches) and have a small brass eyelet in one corner to thread your lokta string through. The gift tags are handmade in Nepal from handmade lokta paper. Remember that these are handmade gift tags and that the exact sizes and the colours may vary.